It seems in Toronto that riding on the sidewalk is illegal unless your wheels are smaller than 62 centimeters in diameter (looks like the folding bike for me). But that law does not seem to be followed, so an old lady has gone all Paul Kersey to alleviate the scourge on the sidewalks. That's the philosophy of Frances Cooper, who says sidewalks are for pedestrians and bike lanes for cyclists. The twain should never meet. These days, she keeps to the middle of the sidewalk during her walks over the bridge, forcing cyclists to ride onto the bike lane. The feisty senior has no qualms about stopping and reprimanding cyclists either. 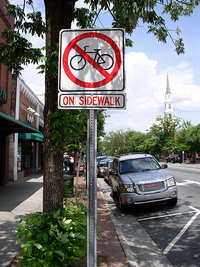 The rules also say bikes with tires over 61 centimetres are prohibited on sidewalks. So is riding/operating a bicycle (or roller skates, in-line skates, skateboard, coaster, toy vehicle) on a sidewalk "without care and attention and reasonable consideration for others." Isn't the second part of that, the only part that matters? If one is riding with "care and attention and reasonable consideration for others" do you really care how big their wheels are? This is the first time I've heard bike lanes used as a reason to get off sidewalks (usually it's a reason drivers cite for cyclists to get out of the road). It does sound like cyclists in Toronto are real jerks though. Yes. We love to sneak up on pedestrians and ring our bell. It makes up for the times drivers do the same with their horns to us. Instead of complaining, Pedestrians should sneak up on those sitting and clap their hands loudly. Hysterical. And demand - yes, my bell is quite demanding with it's high pitched "ding". It commands authority wherever I go. Much more dictatorial than the old "get the f--- out of the way, old woman" I used to use. I understand the desire to minimize the use of sidewalks by cyclists but sometimes you need them. The article generated hundreds of comments and another article. The article certainly shows examples of poor bicycling behavior - but it doesn't really justify banning bikes on all sidewalks at all times. It doesn't help that the city has fallen behind in its plan to create bike lanes on city streets. Right now, there are 89 kilometres of bike lanes, including 12 kilometres added in 2008, when the original goal was to increase total bike lanes this year by 50 kilometres. 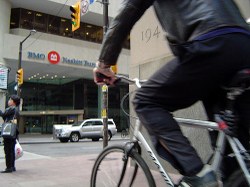 The long-term plan is to create 1,000 kilometres of bike lanes and separate bike paths in the city – an oft-delayed goal now set for 2012. Many riders went to the heart of the issue, saying they cycle on the sidewalk because it's too scary on the road, even in a bike lane. Some said they approach people slowly and swing wide around them, detouring onto the boulevard or road when necessary, trying to share the sidewalk while respecting the primacy of pedestrians. Wentworth is also an instructor with Toronto's CAN-BIKE program, which teaches cyclists how to safely navigate streets without getting into an accident. Course costs range up to $100 for a three-day program that offers advanced training on how to use the streets, said Wentworth. But the bigger challenge is teaching younger people to move from the sidewalk to the street. It would help if a program was developed to teach school-age kids how to make a safe transition from sidewalks to roads, she said, noting that a city study a few years ago revealed that most of the cyclists involved in collisions with cars were teenagers. But there's no funding for such a program. Isn't that better than just blocking the sidewalk? The defacto rule is similar to what we have in DC. "When it comes to the downtown core, or congested areas, sidewalk riding is an absolute danger to pedestrians, even though the argument from the cyclist is that it's too dangerous for them on the road," said Burrows. Suburban areas with wide, busy arterial roads and sidewalks with fewer pedestrians amount to a grey area in terms of enforcement, he said. While it's safer for cyclists to be on the sidewalk, it's still illegal, but police in those areas are usually in cars and not focusing on cyclists. I'm always getting pushed around by joggers in the morning. Joggers shouldn't be allowed on sidewalks either. Remember it's sidewalk not sidejog. Also, roller bladers need to stay off sidewalks, as well as people on those annoying push scooter not to mention the kids on those silly, dangerous skateboards. People with umbrellas also need to stay off the sidewalk. They're always poking others in the eye. And, really, if you're going to be listening to your ipod or talking on your cel phone, then you're obviously not paying attention to where you're walking, so get off the sidewalk. People who walk too slow should also get off the sidewalk. You're jamming things up. Remember it's sidewalk not sidecrawl. And no baby buggies on the sidewalk. They take up too much space. How annoying. Dogs, as well, off the sidewalk. Pigeons should also be kept off the sidewalk but I realize that would be kind of difficult to enforce given that pigeons don't have a good grasp of the law. This all led to a third article. "In an ideal world, the more bike lanes, the better," says Brigitte Nowak, a former citizen member of Toronto City Council's cycling committee and former manager of road safety marketing for the transportation ministry. "Bike lanes are safer for cyclists and make traffic interaction more manageable. But we are a good deal behind where we should be ... so we're going to have a lot of interaction between people and bikes for a while." Nowak is convinced that educating young riders about safely negotiating sidewalks is key. "Two things need to be taught to kids: Every laneway amounts to an intersection when you're on a bike, which means they have to be approached with caution, and pedestrians always have the right of way on sidewalks," she said. In 2005, the cycling committee proposed a school education plan, but they couldn't get funding. It's amazing how much abuse is heaped on cyclists and from both ends of the spectrum (walkers & motor vehicle users alike). I really wish we had a complete network of safe cycling lanes in which pedestrians and motor vehicles were prohibited because both act without predictability. Have you ever rung your bike bell to warn a pedestrian you're approaching, only to have them move into your path? I have. Yikes. Yeah, just last night I almost rear-ended a jogger running in the bike lane, at night, in dark not-reflective clothing (at least wear some sort of vest). I guess the equation there is - bikes are for exercise, so the bike lane is for exercising?